I final­ly got to check out what all the talk is about with Skitch. Skitch.com + Skitch = fast and fun image shar­ing. 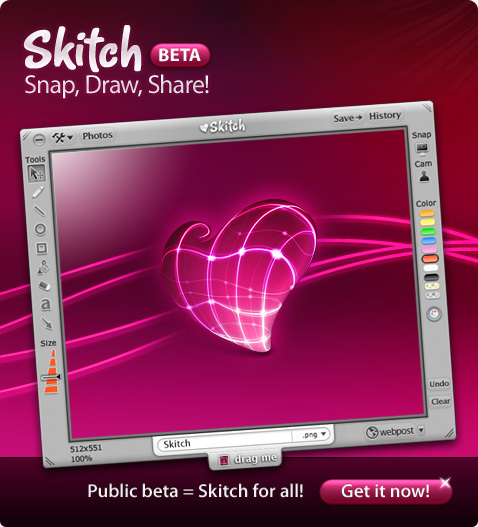 Skitch.com is a web­ser­vice that works hand in hand with our appli­ca­tion Skitch to give you 1-click upload­ing of images for fast and fun image shar­ing. Cur­rent­ly, I use Paparazzi to take screengrabs/screenshots of sites/design I feel inter­est­ing. Before get­ting my Mac­Book Pro, I used a Fire­fox plu­g­in called Screen­grab. With the lat­ter, what I am try­ing to say is that cur­rent­ly, I still use Paparazzi to grab the actu­al web­page, and then “copy (the) image” into Skitch’s can­vas to upload it to Flickr; at least I haven’t found out a way for Skitch can do it auto­mat­i­cal­ly as I’ve only spent 10-min­utes on it so far. Any­ways, Skitch is pro­vid­ing to be bet­ter than I expect­ed; espe­cial­ly when I need to do snip­pets vs whole web­pages. I guess the only appli­ca­tion I can com­pare it is with ScrnShots.com’s tool, Scrn­Shot Desk­top. How­ev­er, I would give point to Skitch as it can just upload to your Flickr account and oth­ers, while you’re just stuck with hav­ing it Scrn­Shots (respec­tive­ly). PS. I do give a point to ScrnShots.com’s tool as it work with Win­dows as well.